1. Fluid control equipment: valves, regulators, actuators, valve bodies, and accessories. 5. Fluid processing equipment: heat transfer, mass transfer, reaction, separation, drying, and storage of pressure vessels. 6. Fluid environmental protection equipment: fluid filtration, water treatment, sewage treatment, air purification, desulfurization and dust removal, and environmental protection equipment. 7. Fluid cooling equipment: cooling tower, cooler, cooling-water machine, water chiller, hear transfer equipment and condenser. 8. Fluid transmission systems and sealing components: fluid sealing systems, hydraulic components, pneumatic components, sealing materials, sealing devices, etc. Guangzhou HeChuan Exhibition Service Co., Ltd.
FlowExpo was founded in 1997 and hold in Guangzhou annually. It is recognized by industry for its “Professional Exhibition, Visitor Match, Remarkable Effect’, and it is also a brand exhibition recognized by Guangzhou Government. Our exhibition is one of the largest, most professional and most advanced technology in the fluid industry. It is an important platform for brand promotion, engineering procurement, technology procurement, supporting cooperation, user negotiation, import & export trade, distribution agency, OEM etc. 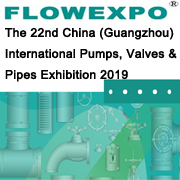 FlowExpo is positioned in providing service for water/purified water/sewage, hot water/steam, oil/natural gas/gas, air/compressed air/smoke, industrial liquid/gases/powder/mixture treatment, processing, transportation, measurement and control engineering. Flowexpo is not only a platform for industry exchanges and trade cooperation, but also a weather vane that has a profound impact on the development of the fluid industry. FlowExpo attracts more than 10,000 professional buyers and suppliers from more than 40 countries and regions every year. It is a global industry exchange and B2B trade show. With the implementation of the national Belt and Road strategy, We focus on inviting experts from the Belt and Road countries to visit exhibition. Making exhibitors grasp business opportunities and get the actual export opportunities. 1. Focusing on energy, electric power, petroleum, chemical, metallurgy, chemical, metallurgy, coating, biomedicine, paper, municipal construction, construction, water supply, gas supply, sewage treatment, environmental protection engineering, machinery manufacturing, plastic machinery, medical equipment and other industries. 2. Having a large database with more than 1 million visitors and inviting visitors through phone, email, SMS and post etc. and the key visitors will be visited and enjoy VIP priority. 3. Visiting more than 120 related associations and inviting the members of associations to visit and purchase. 4. Inviting buyers from over 40 countries and districts including United States, Britain, France, Germany, Italy, Spain, Russia, Japan, Malaysia, Thailand, Vietnam, Iran, Iraq, Taiwan, and Hong Kong etc. through the consulates in Guangzhou and related foreign industry organizations. On-site, organizing Belt and Road National Fluid Machinery, Pump, Valve and Pipe Purchasing Trade Fair. 5. Printing 300,000 tickets and invitations, inviting professional visitors through sending mail and distributing in the similar industrial exhibitions. The exhibition has had 3885 exhibitors, 155,000sqm exhibition area and 226,000 visitors in the past years accumulatively. Exhibitors contain: Emerson, TYCO, FLOWSERVE, ITT, Crane, Maximator, PARKER, Danfoss, John Crane, ARI-ARMATUERN, COLFAX, Hitachi, SAMSON, Bray, LESER, Spirax Sarco, Armsttrong, TLV, Watson Mc Daniel, Douglas Chero, OVENTROP, AUMA, AMERTEK,Perkin Amelmer, Red Point Alloy, Richter EP, Walworth, BUTTING, Linde, NSK, Permea, KANEKO, Teesing, DOOCH, Farex, Rosedale, Teadit, Hoerbiger, FLUKE, FLWA, Superema, NIKKISO, GEFA, Koei, MOTOYAMA, NEWWAY, INTERFACE, SPECTRO, Grundfos, NIKUNI, DEMBLA, WIKA,MELCHERS, Guangyi Electromechanical, BYRUN etc.